You can pick your friends, and you can pick your nose; but you can't pick your friends nose. Any excuse to post a pic of Calvin, right? Oh Calvin, I miss you so. You adventures with Hobbes were the driving force that got me out of bed for school. (well...mom too, I guess). I am going to go out on a limb and declare Calvin and Hobbes to be the best daily comic strip of all time. Yeah, I said it. I mean it, too! There have been other good ones. Bloom County, Foxtrot, Pearls Before Swine, Far Side, Dilbert, Get Fuzzy. Everyone has comics they like. But Calvin....he was the best. because he was so real. How many times did you read a strip and bust out laughing. Because it was funny, but also because you knew exactly what Calvin was experiencing. I remember one winter morning, I was in high school and reading the comics before catching the bus. Panel 1 showed Calvin, all bundled up, walking out into the winter cold. Panel 2 showed Calvin looking at the reader with his face all screwed up in a face that spoke volumes. 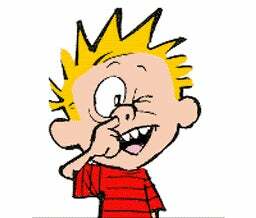 Panel 3 had Calvin holding his nose and saying, "Don't you hate it when your boogers freeze?" That strip had me rotflmao before people knew what rotflmao was. And as a bonus, I stepped outside and it was so cold, my boogers froze. Calvin was real. We all saw ourselves in him in some way. It was a sad, sad day on that December 31st when Calvin and Hobbes got on their sled and said, "Let's go exploring!". But, otter, the nerd he is, does own a copy of the three volume, hard cover, Essential Calvin And Hobbes. I suppose you may be wondering what treat I have in store for you today, given my Calvin introduction. It's simple, really. But it has to wait. First, we need to find out the answer to yesterdays Made Up Monday! I told the truth. Most of the special effect sounds you hear in movies, not just Star Wars, come from everyday items. They generally combine them or use a modulator to alter the pitch, but occasionally, they use a sound in it's original form. I found two examples of pure sounds in Star Wars. I'm sure there are more, but I only found two. One was the sound of the Tauntauns. Straight up Asian Sea Otters. The other unaltered sound? The sound Jabba made when moving. It was Ben Burtt squishing his hands in a cheese casserole. But, back to Calvin. Todays post isn't about Calvin at all. It was just a good way to segway into todays subject. And that subject? Why, boogers, of course. Icky coming up. Feeling squeamish? Come back later. This is gross. Odd, but gross. Really, really gross. You have been warned. Anyway, this post is about boogers. Not what they are. Not how they are made. Not the role they play in our bodies. No, today we're discussing the research of a professor from the University of Saskatchewan, Scott Napper. Ready? Seriously. Gross coming. Last warning! Napper has done some research, and conducted experiments, and has come to a conclusion: eating your boogers is good for you. Boogers collect a lot of bad stuff from getting into your system. Napper thinks that ingesting that bad stuff helps the immune system identify the pathogens and can thus eliminate them easier and faster later in life. He even says that boogers have their sweet, sugary taste because people should eat them. Did you know boogers were sweet? I didn't. But I'll take his word for it. I do a lot of things so you guys don't have to. I read his research. I saw his experiments. (he found a lot, and I mean over a hundred, volunteers to help him). That was enough. If you want to verify they're sweet, you find it out yourself. I have left over Easter candy to satiate my sweet tooth. Now, if you'll excuse me, I have a hankering for lime Jello, for some reason.